Boat enthusiasts rejoice! It’s time for the Fort Lauderdale International Boat Show, also known as FLIBS. Established in 1959 this is the 58th Fort Lauderdale International Boat Show. One of the largest in-water boat shows in the world displaying the most luxurious boats. Fort Lauderdale, known as the “Yachting Capital of the World”, will display yachts, superyachts and much much more. The downtown Fort Lauderdale area will be filled with all kinds of boat and water-based activities for guest to explore throughout the entire Fort Lauderdale International Boat Show. Guests receive one full day of boat loving fun with the purchase of one ticket. The boat show is perfect to view from one of the seven locations on the downtown Fort Lauderdale waterways. Over one thousand exhibitors and more than 1,200 boats are on display throughout this event. There are also special events, including seminars and classes, occurring throughout the entire boat show. This show is perfect for the whole family. Attractions include a children’s fishing clinic, educational sea-life touch tanks, boat workshops, live water sports demonstrations, floating cocktail lounges, and much more. A regular day admission costs $29 for adults and $12 for kids ages 6 to 15. Children under the age of 6 are free. Each ticket is valid for one day only. To attend multiple days there needs to be multiple admission tickets purchased. 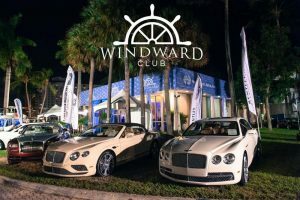 For an extra special experience at the Fort Lauderdale International Boat Show, purchase a ticket for the Windward VIP Club. When guests purchase the Windward VIP experience they receive a day full of luxury. This experience offers guests a private dining area, a premium open bar, gourmet food, and meet-and-greet opportunities. Each VIP package includes one-day show entry, access to Windward VIP Club, and Ulysse Nardin Captain’s Lounge and the Water Taxi. The Windward club is in the central of all the boat show action, close to the superyachts and luxury auto displays. There are multiple lounge areas with air conditioning and indoor private bathrooms that serve as the perfect place to relax. 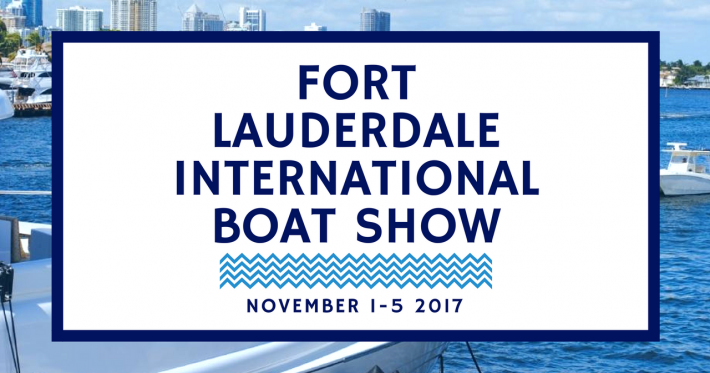 Fort Lauderdale International Boat Show offers many courses and seminars throughout the entire show for both children and adults. These are not courses or seminars you want to pass up. 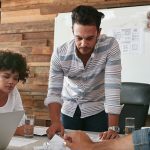 Some courses cost money but a majority of courses come free. Almost all of these courses are located at the Broward County Convention Center. Click here for the exact time, location, and cost of a course or seminar. Learn essential boating skills from experts and licensed captains. Throughout the entirety of the boat show, there are five hands-on boating skills courses offered courtesy of Carefree Boat Club. These courses include basic docking skills, anchoring techniques, open water boat handling, powerboating, advanced docking and precision boat control. Find all Take The Helm courses at the end of Limezone “A6” dock on the south side of Bahia Mar. Space is limited for these courses so it’s wise to book as soon as possible. Book your course now. Attendees of the boat show don’t want to miss out on the fun at the Blue Wild Ocean Adventure Expo. At the Broward County Convention Center a wide variety of experts talk about different water sports in the Blue Wild Expo room. Guest also get the chance to meet celebrity speakers Chris Gillette from Gator Boys and Manny Puig from Jackass and Wildboyz. In addition to speakers, Blue Wild has an extensive Marine Art Display room featuring a wide range of artists. All art and photography display a water-theme from underwater photography to whimsical and contemporary wildlife art pieces. 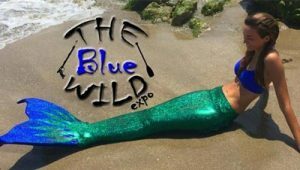 Be sure to stop by the Blue Wild Expo in rooms 222-223 at the Broward County Convention Center. This special event is all about the kids courtesy of Hook the Future. The clinic is free to all children, ages 5 to 16, who have a ticket to the boat show. 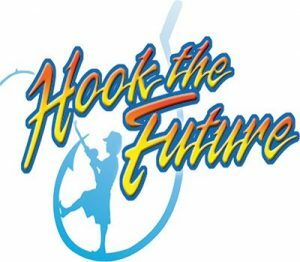 Hook the Future presents these clinics as a way to empower children with the skills of fishing. These clinics only take place on Saturday and Sunday at the Broward County Convention Center. Clinics begin at 12 pm and 2 pm on Saturday and at 1 pm and 3 pm on Sunday. This is a great event your children will surely never forget. 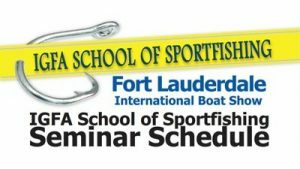 The IGFA School of Sportfishing is having multiple seminars every day of the Fort Lauderdale International Boat Show. These seminars include fishing basics, best tips for catching fish, and much more useful information for fishing. All seminars are free of cost. However, space is limited for these seminars, since they’re free, making them first come first serve. So, if there’s a particular seminar you’re interested in, it’s recommended for you to arrive at least 15 minutes before the seminar time. Check out the seminar descriptions and schedules for each day here. There are a wide variety of superyachts, yachts, and boats that will be present at this show. To find a specific one you can check the boat directory here. Below are some superyachts, yachts, and boats we think are definitely worth checking out. 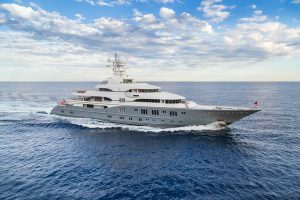 The biggest boat at the Fort Lauderdale International Boat Show is provided by Edmiston, a world leader in the superyacht industry. Prepare yourself for the majesticness and magnitude of the Lurssen named “TV”, a superyacht of 257 feet. Under the supervision of Moran Yacht & Ship, “TV” can be seen at Pier 66 E Dock 501-503. 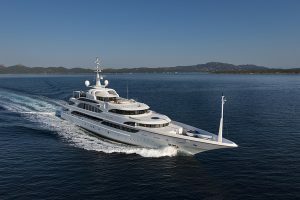 Another boat that’s hard to miss is a superyacht provided by Abeking & Rasmussen, an infamous shipyard in Germany. 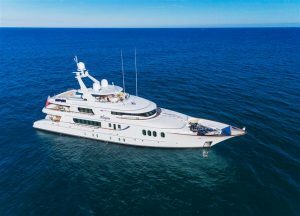 Abeking produces the highest quality custom made yachts and one of their biggest yachts will be on display at the show. 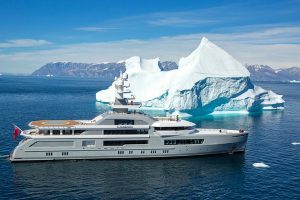 The Abeking superyacht called “Cloudbreak” comes in at 237 feet. To see this superyacht during the show head over to Bahia Mar. A great place to stop at the Fort Lauderdale International Boat Show is at the Denison Yachting displays. There are over 40 boats that Denison will have on display at the show. The biggest yacht on display by Denison is a Benetti yacht of 203 feet called “Mine Games”. This yacht, in particular, is going to be located at Bahia Mar in the blue zone. Another major broker in luxury yachts is Worth Avenue Yachts, with a large display of luxury boats at the show. One of their main boats on display is the “Allegria”, a yacht built by Hakvoort and designed by Glade Johnson. Find this boat at Bahia Mar in the blue zone. Click here to take a sneak peek look inside “Allegria” before you see it at the show. MarineMax connects people with the boat of their dreams. From luxury to practical there is a boat for every lifestyle. There will be many brands of luxury yachts and boats on display by MarineMax at the Fort Lauderdale International Boat Show as can be seen in the video above featuring a Brandamos timelapse. See more of Brandamos timelapse video and photography. For an interesting view of some of the smallest boats in the show stop by Evolution Tenders. This company produces tenders to accompany the most luxurious yachts in the world. Although tenders are an add-on to yachts, Evolution Tenders has a way to make their tenders stand out. Check out the design of their smallest model the M10 here. 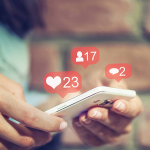 Amanda is a social media marketing coordinator and brand elevator at Brandamos. 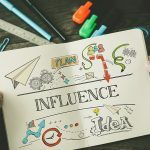 She writes articles tackling various topics including Technology, Social Media, and more. In her personal time she Snapchats her cats as much as possible while browsing cat memes on the internet.